This fluffy baby penguin wears his heart on his sleeve (or should that be wing?) as he holds his lovely heart-shaped balloon. This is a print / reproduction of my original acrylic painting. 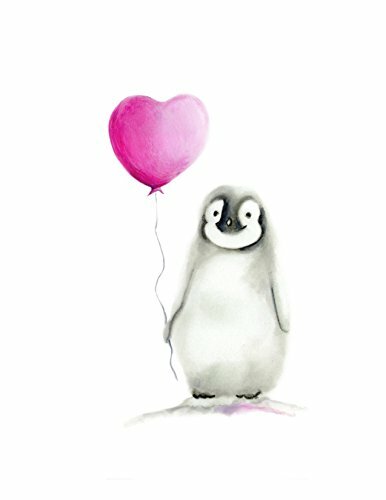 The penguin and balloon will be printed on beautiful, high quality, archival fine art paper that is both acid and lignin free. The print will be signed and stamped on the back by me. He's shown here holding a magenta colored heart-shaped balloon (other balloon color options are available from the drop-down menu - please refer to the color key to see the color options). Paper color: WHITE. Paper layout shown: PORTRAIT (landscape is available from the drop-down menu). Various sizes are available. *Please note that actual colors may vary slightly from what you see on your screen as computer monitors do vary. FRAME AND MAT ARE NOT INCLUDED. Thank you! If you have any questions about this product by Studio Q Gallery, contact us by completing and submitting the form below. If you are looking for a specif part number, please include it with your message.